Now let’s take a look at how each can have an impact on your DIY endeavors. While there are many power tools that will be useful, you should start by looking at hand tools for woodworking. No woodworking tools list would be complete without a hammer, a set of screwdrivers, some saws, a combination square, and a tape measure. These tools will help you succeed with the carpentry basics, but there is an extensive list of hand tools that could be useful depending on the type of work you intend to do. A good cordless drill will be another piece that plays an important role in your woodworking tool kit. With a cordless drill/driver and a good set of bits, you can obviously drill all the holes you may need for your woodworking projects. This tool for woodworking can also be good for driving fasteners. 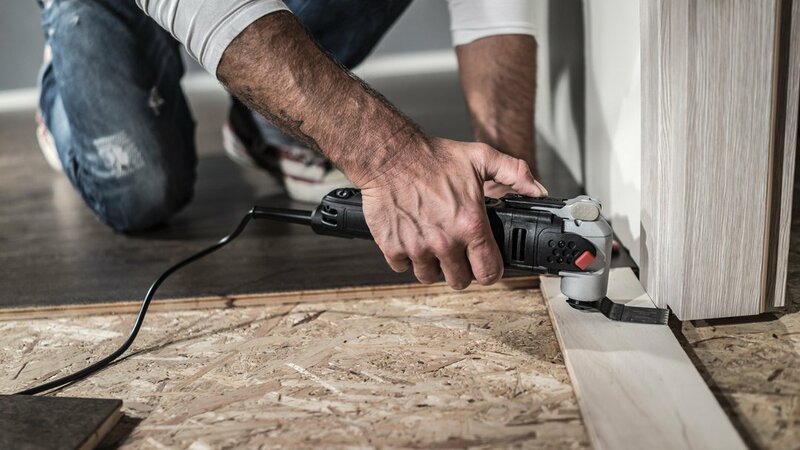 If you want something that is good for driving thicker fasteners, you could also consider adding an impact driver to your list of basic woodworking tools. Your circular saw can be perfect for cutting a wide range of different types of wood and it is perfect for making quick and easy cross-cuts. A model like the Versacut 4.0 Amp Compact Circular Saw is easy to handle and can be used as more than just a saw for cutting wood. With the right blades, you can use this power saw on projects that require cutting metal and tile. Any woodworking tool kit is going to have different types of sandpaper for sanding by hand, but you should also get some type of sander power tool. Most experts would recommend something like the 3.3 Amp 5” Vibrafree Random Orbital Sander. The vibration control makes this sander power tool easy to handle and the random orbit design will leave a better finish than a standard palm sander would. Of course, you could also go with an oscillating saw as your sanding tool. With a sanding pad attachment, it can be used as an effective sander power tool. Even better, there is a wide range of other accessories that make an oscillating tool ideal for more than just a saw for cutting wood. A set of basic woodworking tools should include a jigsaw. With this power tool for woodworking, you have a saw that will allow you to make curved or circular cuts in wood. Of course, if you want to make these cuts a little easier, you could consider a tool like the Rockwell Bladerunner X2 Portable Tabletop Saw. This saw for cutting wood provides a stable platform for making cuts and lets you keep both hands on the wood as you work. This design not only makes the work easier, but it can also provide cuts that are more accurate. In many cases, you are going to need a stable surface to do things like drill, cut, and sand wood, so a good work support should be on any basic woodworking tools list. 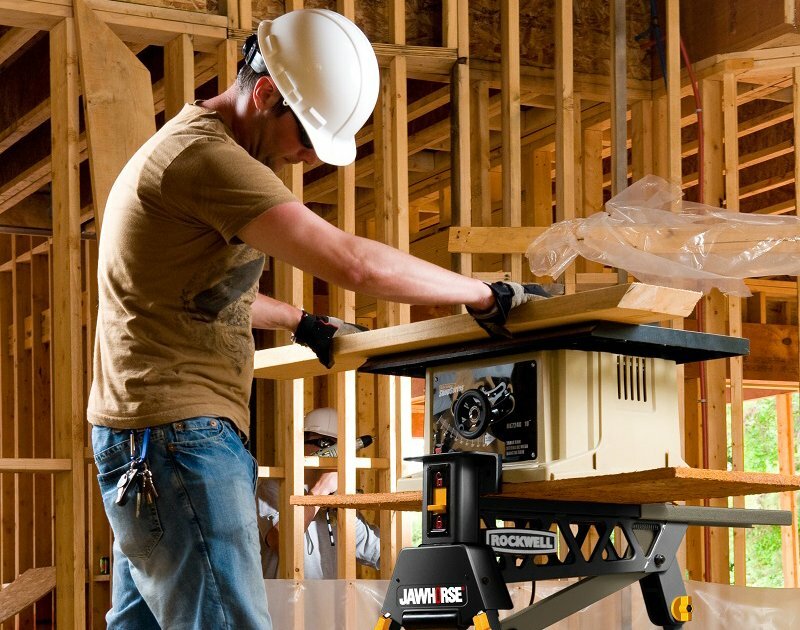 With the JawHorse Sheetmaster Portable Work Support Station, you have a workstation that is strong, stable, and reliable. The clamping jaws can fit a full 4’ x 8’ sheet of material, and they have a clamping force of up to one metric ton. With its portable design and clamps, it can be the perfect work support for a range of DIY carpentry jobs. While you can handle many of the cuts using a miter box or your circular saw, a compound miter saw is a nice tool to have in any woodworking tool kit. It’s perfect for cutting all of your compound angles at the ends of stock. Not only that, but it will also cut down on the time and effort required to make these types of cuts. You certainly could start out with just the miter box, but if you are making a lot of angled cuts, you will eventually want to get a powered miter saw for cutting wood. The table saw is the centerpiece of any serious woodworking shop. Beyond being one of the best tools for making rip cuts, it can also be used for cross-cuts, miters, squares, dadoes, and rabbets. With the 15.0 Amp 10” Jobsite Table Saw with laser, you have a table saw with a large rip capacity and a portable design. This machine can make accurate rip cuts and it can fold up so it can go with you to work away from home. Find all the basic woodworking tools you need for your next DIY carpentry project at Rockwell! This woodworking tools list includes hand tools, a cordless drill, circular saw, orbital sander, jigsaw, work support bench, miter saw, table saw.